Out in Senoko Drive in Sembawang lies a 5,500-square-metre compound, on which three buildings sit belonging to Indoguna. One of them houses an air-drying chamber for cold cuts, sausages, salami and other European-style meats, produced on the premises by a German master butcher. These products find their way to top dining establishments in Marina Bay Sands, Grand Hyatt, Raffles Hotel and the Imperial Treasure and Tung Lok Group of restaurants, among others. They are also bought by home chefs and discerning consumers. Two-decade-old Indoguna started out as a premium meat supplier, but has since branched out into supplying fresh seafood, boutique wines and other fine foods. In the light of its contributions to Singapore's food and beverage (F&B) industry, it has bagged many awards, among them "Gourmet Distributor of the Year" and Awards of Excellence from the World Gourmet Series, the only national accolade recognising excellence in the F&B sector here and in the region. Indoguna managing director Helene Raudaschl credits her mother - the owner of a food import business - with honing her palate for fine foods. She grew up trying raspberries, foie gras, truffles, caviar and smoked salmon, and learning about these foods, which ignited her passion for food and prompted her to set up Indoguna. She has set her sights on making the company a one-stop shopping hub for chefs, one which offers the highest-quality ingredients. Indoguna has established two housebrands which have gained considerable attention in the premium food market: One is Ocean Gems, its 10-year-old line of high-quality seafood, and the other is three-year-old Carne Meats, its premium grade of processed meats produced here, which saves having to import them. Besides supplying to the F&B sector, Indoguna has ventured into the consumer market with its online home delivery unit, GreenGrocer.com.sg, which gives home gourmet chefs and discerning consumers access to top-drawer ingredients from the comfort of their homes. Indoguna sticks to its mission of providing quality food products produced to the highest food-safety standards. "Our philosophy of 'Only the best is good enough' is applied throughout our business. It is only with this addictive passion that our team can be 100 per cent committed to delivering the best the world has to offer," said Ms Raudaschl. The tiger prawns sold under the Ocean Gems label, for example, undergo stringent selection and packaging processes which go into action mere hours after the crustaceans are harvested; crabmeat and the "individually quick-frozen" scallops are pasteurised to the highest international standards, added Ms Raudaschl. Indoguna's in-house processed meats under the Carne Meats label are preservative and filler-free. To ensure that its meats and seafood procured from outside Singapore are of top quality, Indoguna scours the world for these ingredients - king salmon from New Zealand, wagyu beef from Japan, and squab or young pigeon from California. Indoguna executives make it a point to drop in on the production facilities of these suppliers, no matter where they may be. The company's suppliers are in turn invited here so they can see how their products are used in the tail-end of the supply chain to create fine cuisine. All products sold are packaged with technology in the company's plants which are HACCP and ISO-certified and designed to maintain freshness in the foods processed in them. Visits to the company's facilities are also organised for customers so they can see first-hand how product and service standards are maintained. Indoguna, recognising that its 158 employees play an important role in maintaining product and service quality, trains them to follow the latest food-safety standards and product developments. They are also given opportunities to attend trade shows and network within the industry. Through trade shows it organises, Indoguna touches base with what its consumers want. These events include Food Hotel Asia, the World Gourmet Summit and the Asian Masters. 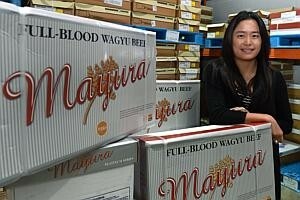 Indoguna has set its sights on entering overseas markets to tap the growing demand for exotic foreign foods. It is looking into supplying pre-prepared halal and Asian foods to the Middle East, Asia and Europe. Ms Raudaschl said: "It is the beginning of a new journey for us, with quality and food safety continuing to be the twin pillars of the Indoguna's value system."